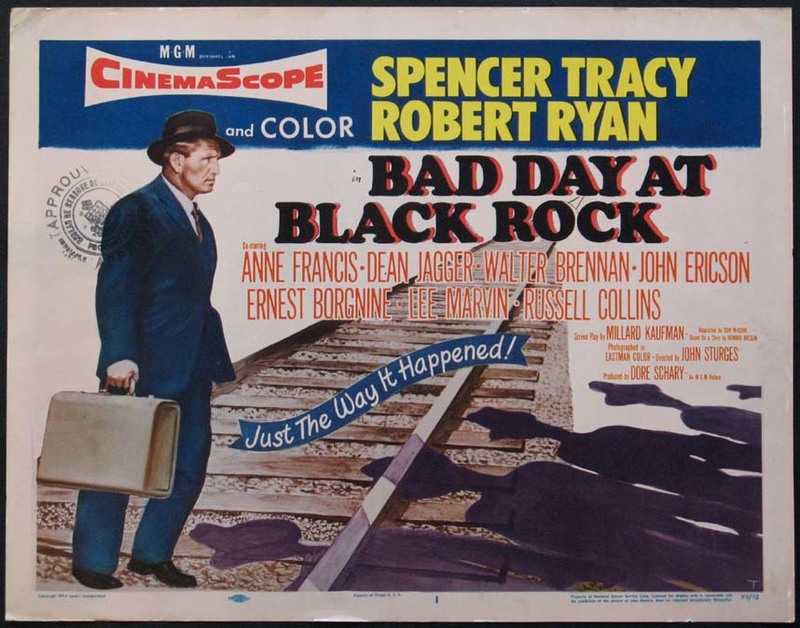 BAD DAY AT BLACK ROCK is compelling viewing from its very first moments, as Andre Previn's score combines with William C. Mellor's dazzling widescreen cinematography of a train hurtling through the desert to convey a tremendous sense of excitement. That excitement doesn't let up even when the train slows to a halt, as the viewer is immediately curious to learn why the townspeople of the desert burg of Black Rock are so stunned that the train has stopped. 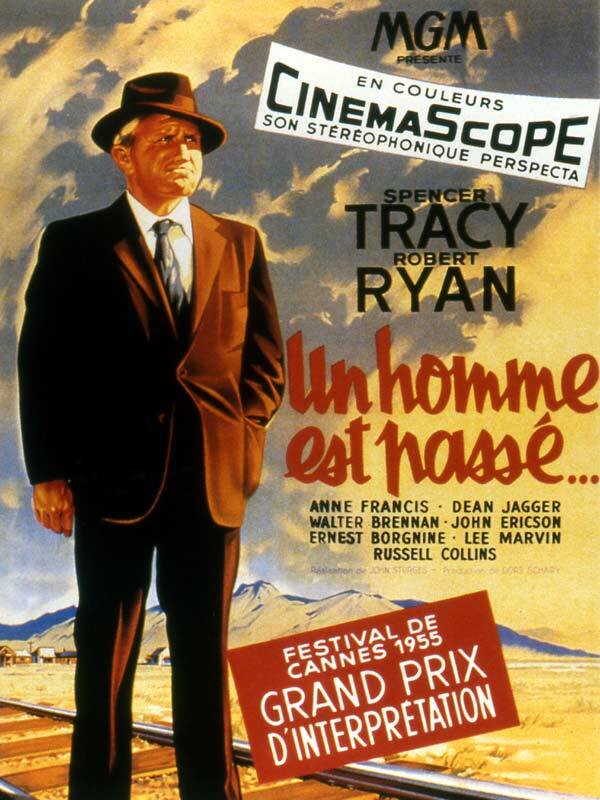 It's 1945, and John J. Macreedy (Spencer Tracy), a one-armed veteran, gets off the train. The townspeople are hostile, and they grow only more so when Macreedy starts asking uncomfortable questions as he searches for a man named Komoko. It seems that the town of Black Rock harbors a terrible secret. Is the one-armed man strong enough to stay alive while finding the answers he seeks? And will anyone in town help him? Although I often discuss plots in some detail, in this case to say much more about the story and Macreedy's character might spoil it for those who have yet to see the movie. This is one of my favorite Tracy performances, playing a gutsy, cagey, and resourceful man despite his handicap. This film has a fantastic cast, boasting not one, two, three, or four, but five Oscar-winning actors: Tracy, Dean Jagger, Walter Brennan, Ernest Borgnine, and Lee Marvin, who among them accumulated a total of eight Academy Awards. The movie also stars one of Hollywood's truly great actors, who should have won an Oscar at some point, the one and only Robert Ryan. The cast also includes Anne Francis and John Ericson as a brother and sister mixed up with Ryan and his pals. Walter Sande and Russell Collins round out the main cast. Besides an interesting story acted by superior talent, the movie has a terrific look, with outstanding widescreen photography in the area of Lone Pine, California; Black Rock was built outside of town, and additional action scenes were filmed in Lone Pine's distinctive Alabama Hills. 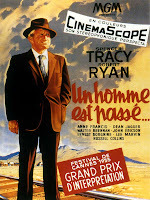 The effective use of CinemaScope is one of the movie's chief pleasures, a key element in the film's powerful style. The film isn't perfect; for instance, I felt that the Anne Francis character was vaguely written, lacking in back story and motivation. I tend to prefer short films, but at just 81 minutes, this one could actually have stood a few more minutes fleshing out the characters. That said, it's an excellent movie which is very entertaining and made with great craftsmanship. This film was directed by John Sturges, whose best-known films include THE MAGNIFICENT SEVEN (1960) and THE GREAT ESCAPE (1963). Sturges films previously reviewed here: THE WALKING HILLS (1949), RIGHT CROSS (1950), MYSTERY STREET (1950), ESCAPE FROM FORT BRAVO (1953), THE SCARLET COAT (1955), BACKLASH (1956), SADDLE THE WIND (1958), and ICE STATION ZEBRA (1968). 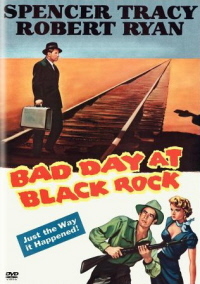 BAD DAY AT BLACK ROCK has been released in a superb widescreen DVD. Extras include a commentary track. The DVD can be rented via Netflix. The film is also available on Amazon Instant Video. It's also been released on VHS multiple times. This film can also be seen on Turner Classic Movies. The trailer is here. 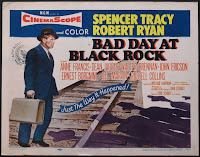 BAD DAY AT BLACK ROCK was the fourth title on my personal list of "unseen classics" to watch in 2011. It follows SHANE (1953), DOUBLE INDEMNITY (1944), and SULLIVAN'S TRAVELS (1941). One more film and I'll be halfway to my goal! January 2017 Update: BAD DAY AT BLACK ROCK is now available on Blu-ray from the Warner Archive. February 2017 Update: My review of the Blu-ray is here. This one has been on my list a long time, as well. I should make sure to get to it soon! Thanks for the reminder, and yes, for not giving too much away. :) I didn't realize it has such a fine cast of supporting actors! Definitely something to look forward to.